Compact, anti-theft backpack and with a charging port for the built-in mobile, this smart backpack will make you move around the city will be a more comfortable experience. Every day more than 400,000 bags are produced worldwide , but with the smart and Bobby compact backpack will no longer have to worry about what might happen to you, because it has been designed anti-theft, with a material proof , Zip fasteners and hidden pockets that will keep your belongings safe when traveling: make a traveler happy giving it to her. She is slightly smaller than her older sister, the Bobby backpack . Other differences with the Bobby backpack is that its front is made of polyurethane synthetic leather and is available in five very cool colors. Moreover, at its base, inside a zipper bag, Includes a waterproof cover to protect it better if it rains or if you have to support it against some surface during your travels. As an additional accessory, it includes a small zippered bag with a polyester fabric shopping bag that will be very practical in many occasions. Not only is it an extremely safe backpack, it also has features that make it a practical and convenient accessory, such as an external USB charging port to which you can connect a battery inside the backpack and connect your devices to recharge them; The weight will be balanced, it is designed so that you notice between 20 and 25% less load on your back distributing it so that it lies closer to your back. It is made of high quality water repellent polyester fabric that allows the air to ventilate it and thus does not make you sweat; A combination of several layers of various materials includes a comfortable six-mm layer of anti-shock foam, so your devices will be well protected. It has a reflective band in the center and sides, which will make you more visible at night and increase your safety if you ride a bike, and with a strap so you can hold the backpack to the handle of your suitcase on your travels. Access to all elements of the interior is easy and comfortable, with three opening modes, 30, 90 and 180 degrees, according to your needs at any time. It incorporates hidden pockets in the sides and in the back, In them you can carry the wallet, the passport or the mobile and access them without taking your backpack, as well as two front pockets to carry the transport card. It has several cushioned compartments: for a 13 "laptop, for a 10" tablet, for a water bottle and two for various objects, one with a zipper bag and a carrying strap organized with four pencils or pens. 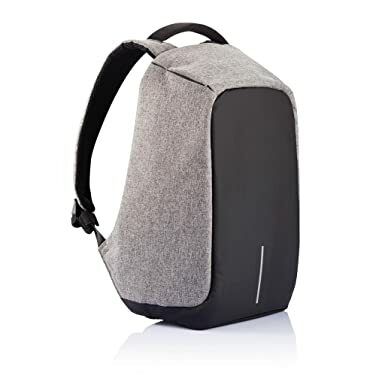 Intelligent and compact anti-theft backpack with USB charging port. Material: high quality polyester and PU synthetic leather. Measures: 40 cm high x 29 cm wide x 14 cm deep. It includes a zipper bag inside which carries a polyester shopping bag. In its base it incorporates in a bag with rack a cover to protect the backpack in different occasions. USB charging port for charging devices. Easy access to all elements in the interior. Padded compartment for a 13 "laptop and a 10" tablet.